J. Cameron Monroe traveled to site of Sans-Souci in the town of Milot in Haiti. He was examining the architectural history of the site, which was the royal palace of Henry Christophe, the first and last king of the kingdom of Haiti (1811-1820). Graduate student in anthropology David Ingleman (pictured) assisted. Photo by J. Cameron Monroe. Archaeology Magazine, a publication of the Archaeological Institute of America, featured the research of J. Cameron Monroe, Director of the Archaeological Research Center and anthropology professor, in their January/ February 2016 issue. "Under a Haitian Palace" is the latest article in the magazine's "From the Trenches" feature and talks about Monroe's important work at the site of Sans-Souci in Haiti. 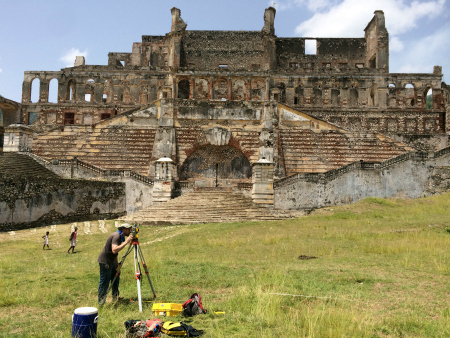 Daniel Weiss writes, "Archaeological digs have been rare in Haiti because of its political and civil instability [...] The team located a major structure below the palace complex that they believe is an early phase of construction." Read the full article here. To learn more about Monroe's research and unearth more pieces from the past, visit the Archaeological Research Center's website.